Chimayo is a sanctuary in New Mexico. Starting from Los Alamos where the atomic age was born, descending to the desert into Espanola, the low-rider capital, to the eastern mountains wherein lies Chimayo is about 60 some miles. 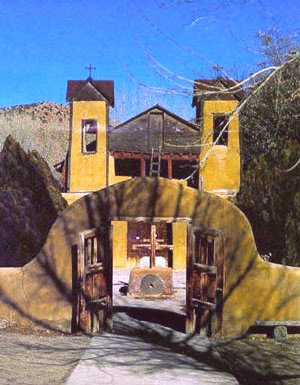 outside the church at Chimayo. I am rooted in the soil. What is it to run o'er the earth? running faster than a ghost! I sense small lives upon my course. I burst free to come to you! nor would he flow without her need.